Kolkata, Oct 2 (IANS) Chile’s Under-17 football team coach Hernan Caputto on Monday wished he would never have to face the three other teams in Group F again after the preliminary stages of the FIFA U-17 World Cup, starting October 6. Chile are placed with England, Iraq and Mexico in the group and will play their matches at the revamped Salt Lake Stadium. The 21-member squad trained for a little more than one hour on Monday, six days ahead of their opener against England on October 8. “All teams are tough. 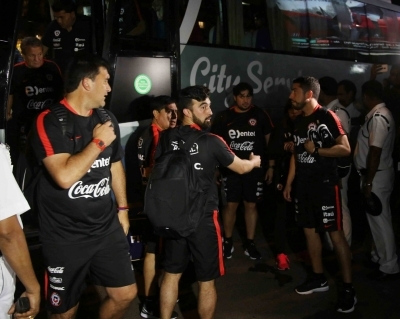 I hope not to face them again,” Caputto, an Argentine, told reporters after training here. Caputto said Chile have been preparing for the tournament for nearly six months. “We have been preparing for nearly six months. You must understand this is an U-17 team so you have to train them the right way and take this experience forward,” he said. Since Chile finished runners-up in the South American U-17 Championship earlier this year, four new players have joined the squad. Caputto said senior team stars like Arturo Vidal and Alexis Sanchez inspire the colts and that they have spoken to them before coming here. Chile had watched Shah Rukh Khan-starrer Bollywood flick “Chak De India” before landing in India. Chile qualified for the tournament after a gap of 20 years.